Flush With Oil, Abu Dhabi Opens World's Largest Solar Plant : The Two-Way The new plant is expected to generate 100 megawatts of power and supply 20,000 homes with electricity. Rows of parabolic mirrors at the Shams 1 plant in Abu Dhabi. 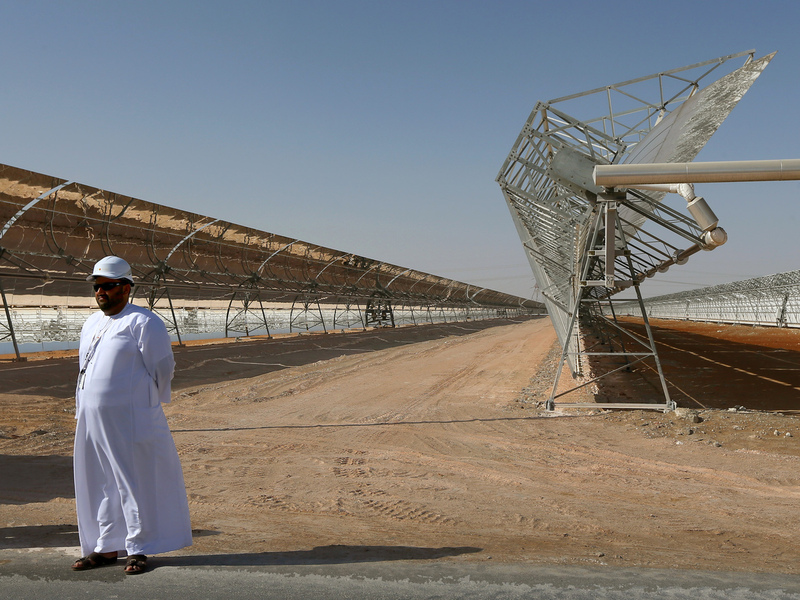 Abu Dhabi, the most oil-rich of the United Arab Emirates, is now home to the world's single-largest concentrated solar power plant. The 100-megawatt Shams 1 plant cost an estimated $750 million and is expected to provide electricity to 20,000 homes, according to the BBC. Bloomberg says the less oil Abu Dhabi uses for local consumption, the more it can export. Sultan Ahmed al Jaber, head of Abu Dhabi Future Energy Co., speaking at a news conference for the plant's opening over the weekend, said it is part of a "strategic plan to diversify energy sources in Abu Dhabi." "Together, with clean energy and nuclear energy, it will make up 7 percent of Abu Dhabi's energy sources from renewable energy sources," he said. Officials in Abu Dhabi hope Shams 1 will save 175,000 tons of carbon dioxide annually, the equivalent of taking 15,000 cars off the road. The plant is the first of several more on the drawing board. "The country is seeking about $100 billion in investments to generate about 41,000 megawatts, or a third of its power, from solar by 2032. That compares with about 3 megawatts now, which puts it behind Egypt, Morocco, Tunisia, Algeria and the United Arab Emirates in capacity, according to Bloomberg New Energy Finance."